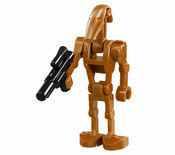 The Battle Droid is a Star Wars minifigure first released in 1999. Battle droids were used by the Trade Federation and later the Confederacy of Independent Systems in the Clone Wars. They form the majority of both organisations' armies. They appear in many Star Wars sets, especially from Episode I, Episode II and Episode III. They were usually produced in plants on distant planets such as Geonosis and Hypori. After being programmed, they were sent on missions against the Republic, or used to spread fear on star systems opposing the Trade Federation. Regular Battle Droids had no mind of their own, and they were controlled by a central computer. Battle droids were designed to defeat their enemies by sheer number of units. They had little ability to think independently, and were very vulnerable to tricks. The droids could operate in almost every environment, including underwater. The basic battle droids, with no markings are the B1 series. In addition, the OOM series such as the Battle Droid Commander, the Pilot Battle Droid, and the Security Battle Droid were given control over some groups. 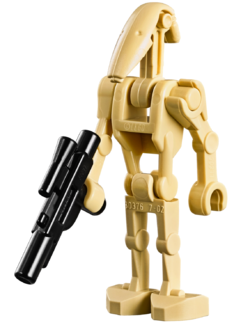 Since the 7662 Trade Federation MTT set, Battle Droid minifigures have had arms with vertical gun grips, as opposed to the older horizontal grips. Because they have new arms they can vertically grip Guns. These arms can be taken off easily, but break with slightly less pressure to the older variety. They appeared from 2007 onwards. In the LEGO Star Wars video games (except for the Clone Wars), the normal and Geonosian Battle Droids come with a thin two-stud piece and black antennae piece on their back. This page was last edited on 18 January 2019, at 21:49.